Here is a terrific, free application that you can download on your iPhone that will help you manage your camera gear. 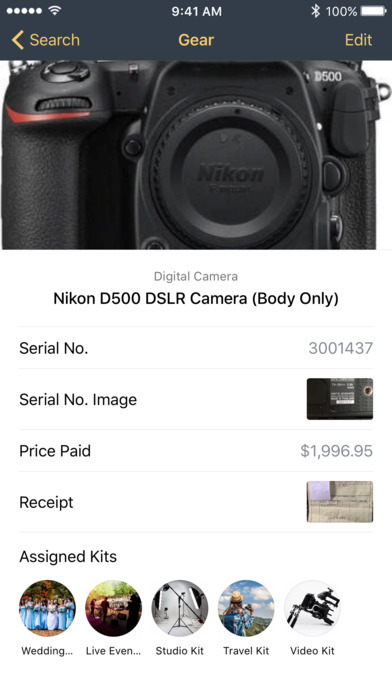 My Gear vault will help you manage your camera gear, keep up with receipts of purchase, as well as the serial number of your gear, in case of theft or damage. I've been keeping up with my info in Notes on my Mac, it's not ideal though. This app is nice and much easier to sort than in my Notes app. Plus, I have a lot of equipment. 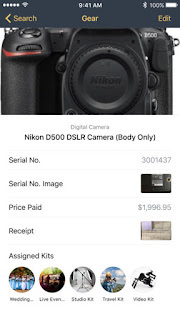 This app has most of it already listed, I just search the device and the details auto-fill, minus serial and receipt. "MyGearVault is a FREE app designed to help photographers and videographers from professionals, to amateurs, to even hobbyists, know what they have and what it’s worth."